'U.K. Parliament report details how NATO’s 2011 war in Libya was based on lies', 2016, Salon: "On March 17, 2011, the report points out - two days before NATO began bombing - Qaddafi told rebels in Benghazi, “Throw away your weapons, exactly like your brothers in Ajdabiya and other places did. They laid down their arms and they are safe. We never pursued them at all.” - The Foreign Affairs Committee adds that, when Libyan government forces retook the town of Ajdabiya in February, they did not attack civilians. 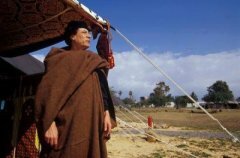 Qaddafi "also attempted to appease protesters in Benghazi with an offer of development aid before finally deploying troops," the report adds." 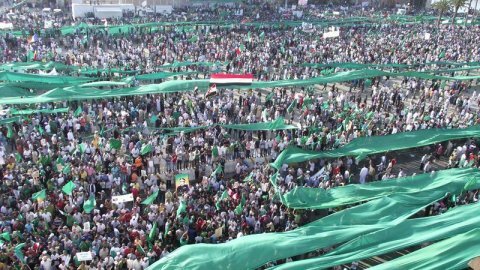 "During the invasion of Libya, 1.7 million people, 95% of the population of Tripoli and one third of the entire population of Libya, gathered in downtown Tripoli in what has been called the largest demonstration in world history to support Qaddafi and the revolution." "NATO’s destruction of Libya simultaneously achieved three strategic goals for the West’s plans for military expansion in Africa. Most obviously, it removed the biggest obstacle and opponent of such expansion, Gaddafi himself. With Gaddafi gone, and with a quiescent pro-NATO puppet government in charge of Libya, there was no longer any chance that Libya would act as a powerful force against Western militarism. Quite the contrary - Libya’s new government was utterly dependent on such militarism and knew it. 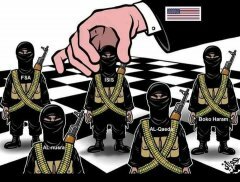 'Western foreign policy as a protection racket', 2014, Dan Glazebrook: "The Libyan Islamic Fighting Group (LIFG), who acted as NATO’s foot soldiers in the battle to oust Gaddafi, were given advanced weaponry and training by Britain, France and Qatar, and were ultimately able to seize Libya itself as a safe haven for operations across the region as a result. LIFG’s close links to other regional militia such as Al Qaeda in the Islamic Maghreb and Boko Haram are well documented, and as early as January 2012, the UN were issuing reports warning that NATO’s actions in Libya had greatly boosted the fighting capacity of Boko Haram and their allies. So it is no surprise that both AQIM and Boko Haram have been able to launch much more audacious attacks in the wake of the NATO’s destruction of Libya. These groups have been massively boosted by the support and territory they acquired both directly from NATO and as a result of its actions. In an excellent piece for spiked-online, Brendan O’Neill has thoroughly documented the indisputable link between NATO’s arming of sectarian death squads in Libya and the subsequent growth in capacity of Boko Haram, which has empowered them to organise attacks such as the kidnapping of almost 300 schoolgirls earlier this year. But this growing chaos has provided a much more fertile environment for the West’s latest attempt to convince Africa that its military forces are now "needed" after all. Effectively, Western foreign policy has become little more than a protection racket. In classic mafia style, the initial rejection of the US offer of AFRICOM "protection" was met with extreme violence (against Libya), and enabled destabilising militias to step up attacks on countries throughout the region, from Algeria to Mali to Nigeria. Now the West is able to repeat its offer – this time hoping for a more sympathetic hearing, having unleashed the very forces from which it is now offering protection. The same is clearly the case in Iraq. Nuri al-Maliki, Iraqi prime minister, has grown increasingly distant from the West in recent years, signing huge oil contracts with China, maintaining good relations with Iran and refusing to support Western-backed "regime change" in Syria. Now he is facing a massive onslaught from the forces of ISIL (Islamic State in Iraq and Syria), a group not only empowered but created as a result of the West’s policy of sponsoring violent upheaval in neighbouring Syria. Now that upheaval has spilled over into Iraq, Maliki, like Goodluck Jonathan in Nigeria, is being offered "protection" by the US and the UK, the same governments that set in motion the forces they are now fighting. In other words, when the US and Britain offer "support" for Nigeria against Boko Haram, or for Iraq against ISIL, they are offering protection against a threat which they themselves are responsible for. The flooding of North Africa and the Middle East with armed militias – the overt and predictable consequence of NATO’s actions in Libya and Syria - aims to make Africa and the Arab world dependent on the West for its security needs. Norwegian pilots explains in 2013 that they had to find their 'targets' on their own. In other words, theuy had no idea who the targeted.